Be reminded when you arrive or leave a location. While editing a reminder, tap , then turn on “Remind me at a location.” Tap Location, then choose a location from the list, or enter an address. 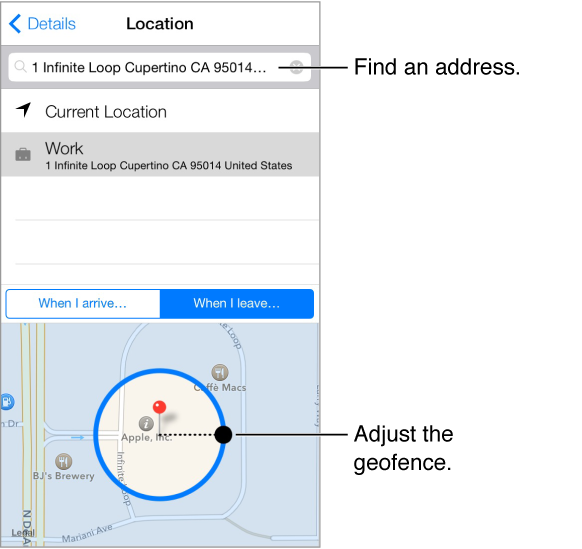 After you define a location, you can drag to change the size of the geofence on the map, which sets the approximate distance at which you want to be reminded. You can’t save a location reminder in Outlook or Microsoft Exchange calendars. Add common locations to your address card. When you set a location reminder, locations in the list include addresses from your personal info card in Contacts. Add your work, home, and other favorite addresses to your card for easy access in Reminders.